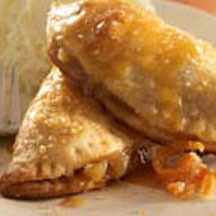 These sensational marsala-kissed Fuji apple and mascarpone turnovers, topped with a drizzle of luscious orange caramel, were created by Chef Kent Rathbun. For Orange Caramel: Place 2 cups sugar in small sauce pot. Cook over high heat until it starts to melt. Continue stirring until sugar is completely melted and starts to turn golden brown. Reduce heat and slowly add cream until sugar cools. Add orange juice, 1/2 cup butter and 2 teaspoons vanilla. Remove from heat and strain. Stir in orange zest and set aside. For Filling: Melt 2 tablespoons butter and the brown sugar in large sauté pan. Add apples and cook until they start to soften. Sprinkle in cornstarch; cook until mixture starts to thicken. Carefully add marsala and remaining 2 teaspoons vanilla; cook 1 minute. Remove from heat and cool. Beat Mascarpone, 1/2 cup sugar and cinnamon in mixing bowl until smooth, being careful not to overbeat. Fold cooled apples into the cheese mixture until incorporated. Final Preparation: Place heaping tablespoon of apple filling in center of each pastry round. Brush edges with egg wash. Fold pastry in half, creating half moon shape. Press edges together and press with fork to seal. Brush turnovers with remaining egg; sprinkle with coarse sugar. Bake in a preheated oven at 350°F (175°C) 22 to 27 minutes or until golden brown. Serve with orange caramel sauce. Add scoop of vanilla ice cream on side, if desired. Or serve with a dollop of equal portions of mascarpone and whipped cream, mixed.